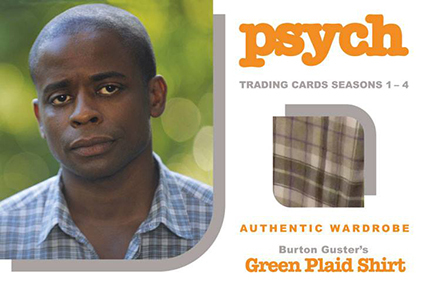 2013 Cryptozoic Psych Seasons 1-4 is the first set of trading cards for the popular cable dramedy. Besides covering the first bunch of episodes, the release includes a broad mix of autographs, costume cards and other inserts. 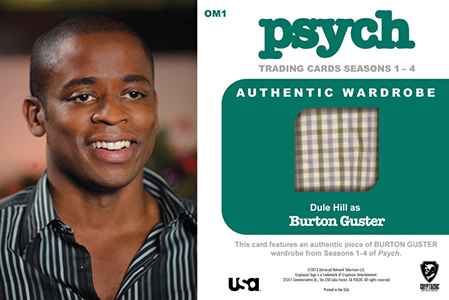 The 68-card base set provides a broad recap of the 63 episodes that aired between 2006 and 2010. 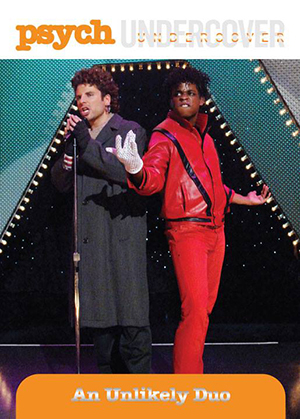 The show, which broadly blends the comedy and crime genres, stars James Roday and Dule Hill as Shawn and Gus, a pair of crime consultants. 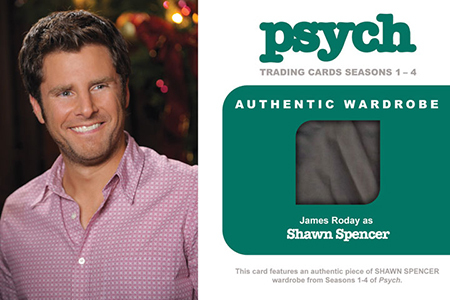 The main premise of the series is that Shawn has tricked the police into thinking that he's psychic. Rather, he's just really good at observing things. 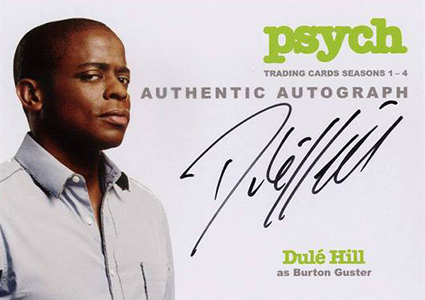 The 2013 Cryptozoic Psych Seasons 1-4 chase is led by autographs and Wardrobe Cards, both of which fall one per box. Confirmed signers include Hill, Ally Sheedy and Robert Patrick. 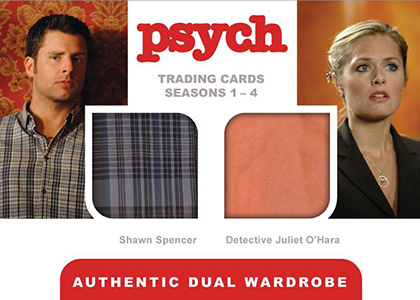 Wardrobe cards come with swatches of costumes used in the show. Collectors can also look for prop cards. The release has three basic insert sets as well. 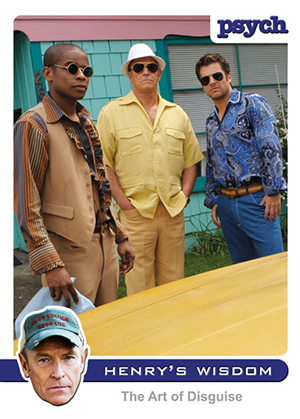 Incognito showcases some of the undercover gear worn on the show. Henry's Wisdom covers the life lessons given by Shawn's dad, who is played by Corbin Bernsen. 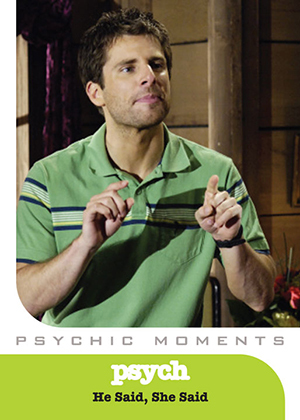 Finally, Psychic Moments focuses on Shawn's greatest "visions." Sold separate, there is also a binder designed specifically for the set. 68 cards. Shop for base sets on eBay. 11 cards. A10 does not exist. Inserted 1:24 packs. Click here for a detailed look at the entire set. 22 cards. Inserted 1:24 packs. M22 exclusive to the set's binder and is not in packs. 5 cards. Inserted 1:96 packs. How much will they cost when they come out and where can I buy them? Angela � Looks to be about $70 per box. We have links to eBay auctions arranged by price at the top and bottom of the article. More boxes and singles will be offered as the set releases. I’m sure we all know who A10 is… Wonder why the card didn’t happen though? Ryan � On their site, Cryptozoic said they had been waiting on it but it came time to release. It happened with Walking Dead S1. There was a gap that was later filled when Laurie Holden signed her Season 2 cards as well. So it’s possible it’ll be filled at a later date.